We are thrilled to host one of the stops on the Fierce Reads 2015 tour! Four amazing YA authors will appear at one venue, talking about their books and anything else. When: Friday, May 15, 7:00 p.m. Ordering: A limited number of autographed copies of these books will be available for purchase after the event. If you cannot attend the event, and would like a personalized copy of a book, please call us before the event at (281) 497-8675. This year's Fierce Reads tour visits Changing Hands Tempe with four YA authors — Marie Rutkoski, Lindsay Smith, Katie Finn and Lynn Matson. Marie Rutkoski presents the second book in her Winner's series, The Winner's Crime. The engagement of Lady Kestrel to Valoria's crown prince is the event of a lifetime, but to Kestrel it means living in a cage of her own making. As she aches to tell the truth about her engagement, she becomes a skilled practitioner of deceit, a spy that passes information and gets ever closer to uncovering a shocking secret. Lindsay Smith visits with the sequel to Secret, Skandal. Yulia and Valentine have escaped Russia to live in Washington, D.C. where they work with CIA psychics, including Yulia's increasingly erratic father. Kate Finn presents another installment of her Broken Hearts and Revenge series, Revenge, Ice Cream, and Other Things Best Served Cold. Gemma and Hallie find themselves locked in an escalating revenge cycle involving everything from strawberry syrup to stolen identities. But just when Gemma thinks she has the upper hand, the biggest bombshell of all is dropped. And it's one that threatens to change her life forever. Lynne Matson shares the next installment of her survival-thriller Nil series, Nil Unlocked. On the island of Nil, you have exactly 365 days to escape — or you die. Seventeen-year-old Charley doesn't know the rules. She doesn't even know where she is. The last thing she remembers is blacking out, and when she wakes up, she's naked in an empty rock field. Lost and alone, Charley finds no sign of other people until she meets Thad, the gorgeous leader of a clan of teenage refugees. Soon Charley learns that leaving the island is harder than she thought . . . and so is falling in love. With Thad's time running out, Charley realizes that she has to find a way to beat the clock, and quickly. ABOUT THE AUTHORS Marie Rutkoski is a professor of English literature at Brooklyn College. She specializes in Renaissance drama, children's literature, and creative writing. She lives in New York City. Lindsay Smith'S love of Russian culture has taken her to Moscow, St. Petersburg, and a reindeer festival in the middle of Siberia. She writes on foreign affairs and lives in Washington, D.C.
Katie Finn is the author of the Top 8 trilogy. She's never plotted revenge on anyone (who didn't deserve it) but has been known to assume another identity. 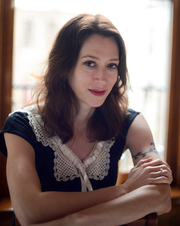 She's also acclaimed author Morgan Matson (Amy and Roger's Epic Detour). She lives in Los Angeles, in a house she wishes was a lot closer to the beach. Lynne Matson grew up in Georgia in a house full of books and a backyard full of gnarly pines. She attended the University of Florida, where she met and married her husband, the cutest boy she's ever seen. Now, Lynne is mother to four amazing boys. After a career as an attorney, Lynne is thrilled to be making her debut in YA fiction. The Fierce Reads tour which features an awesome group of YA authors makes it return to Vroman’s for an event that will feature a moderated panel between all the authors, a pizza party, bookish bingo, a photo booth, and of course, a chance to mingle with the authors and get books signed! Featured authors include Katie Finn (author of Revenge, Ice Cream and Other Things Best Served Cold), Lynn Matson (author of Nil Unlocked), Marie Rutkoski (author of The Winner’s Crime) and Lindsay Smith (author of Skandal) Those wishing to get books signed will be asked to purchase at least one copy of the author's most recent title from Vroman's. For each purchased copy of the newest title, customers may bring up to three copies from home to be signed. This policy applies to all Vroman's Bookstore events unless otherwise noted. Save your Vroman's receipt; it will be checked when you enter the signing line. Tuesday, May 12, 6:00 p.m.
We’re hosting a Fierce Reads Spring Fling and couldn’t be more excited. Join us for bookish bingo, pizza, a raffle, and these wonderful YA authors. They will be in conversation with Evelyn Skye. Marie Rutkoski: The Winner’s Crime As Kestrel comes closer to uncovering a shocking secret, it might not be a dagger in the dark that cuts him open, but the truth. Lies will come undone, and Kestrel and Arin learn just how much their crimes will cost them in this second book in the breathtaking Winner's trilogy. Lindsay Smith: Skandal The dramatic sequel to SEKRET, this psychic Cold War espionage thriller follows Yulia to Washington, DC, where she fights to discover the truth about her family without losing control of her mind. Katie Finn: Revenge, Ice Cream, and Other Things Best Served Cold After the humiliating events on the 4th of July, Gemma's trying to grapple with the fact that Hallie knew her true identity all summer, and that she was the one who stole Teddy from her. Gemma vows revenge, but things immediately get more complicated than she planned. Lynne Matson: NIL Unlocked On the island of Nil, the rules are set. You have exactly 365 days to escape--or you die. Shadow and Bone by Leigh Bardugo The Shadow Society by Marie Rutkoski Promised by Caragh O'Brien Crewel by Gennifer Albin Square Books, Jr. welcomes to Oxford four authors of young adult and teen fiction who are making their way around the country on MacMillan's Children's Publishing group multi-city Fierce Reads tour. Ready for Halloween? Come hear some literary wizardry from bestselling Leigh Bardugo, with Shadow and Bone (Henry Holt, $17.99), along with Gennifer Albin, author of Crewel (Farrar, Straus and Giroux, $17.99); Caragh O'Brien, Promised (Roaring Brook, $17.99); and Marie Rutkoski, Shadow Society (Farrar, Straus and Giroux, $17.99). Ages 15 and up. Elise Broach promotes Masterpiece. ; Marie Rutkoski promotes Kronos Chronicles. Marie Rutkoski is currently considered a "single author." If one or more works are by a distinct, homonymous authors, go ahead and split the author. Marie Rutkoski is composed of 2 names. You can examine and separate out names.